You know when you meet someone, and she is wearing beautiful Kendra Scott jewelry, and she has a huge beautiful smile and you ask her why she is excited to meet her fiance and she quotes the TV show Friends to you 'He's my lobster!' and you are like 'I adore this girl, and want to be her friend forever!!'??? Yes, this happens, and yes, it happened to me when I met Janine at the Phoenix Bridal show at the Phoenician Resort last month! Her energy and excitement rubbed off on me, and I was so excited to meet her "lobster" and photograph them together. 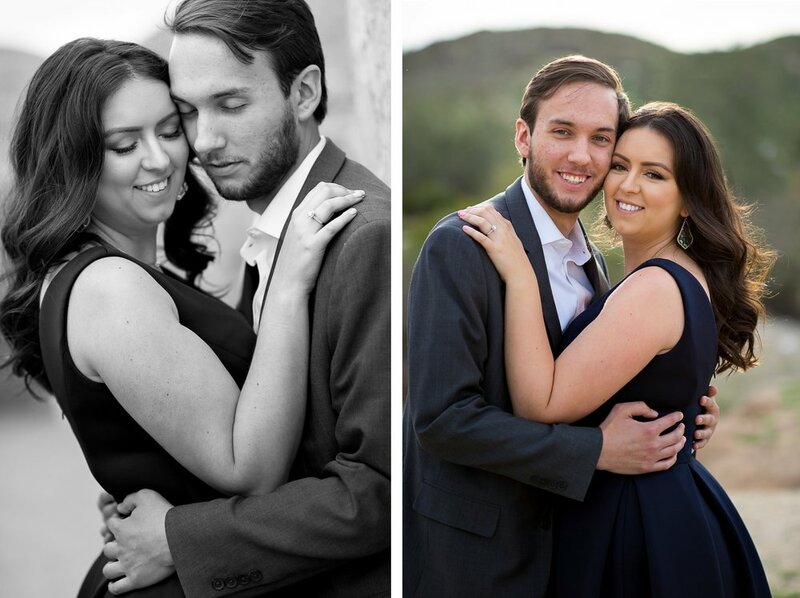 They met in Oklahoma, fell in love in Texas, and are now getting married and making their home in Arizona. When we were talking about locations we knew we wanted some dessert, to show off their new home, and also a bit of ranch as a nod to their history together. Scorpion Gulch at South Mountain was the perfect spot, and I am in love with the warm, sunset glow that we were able to find before the end of the evening. It was obvious throughout the entire session how much these two adore each other. They were super sweet, and I enjoyed every minute!! Enjoy your photos, guys!! I cannot even begin to tell you how much I love these outfits!! I LOVE when my brides and grooms get dressed up in nature, I think that the formal with the natural is such a great combo, and I am IN LOVE with this navy blue/gray combo! Well done, guys! Sometimes the little in-between moments are the best!! And can you beat this old building?!?! Let me answer that for you... no you can not! Janine is obviously gorgeous no matter what, but she did have a professional hair and makeup artist get her ready for our shoot. 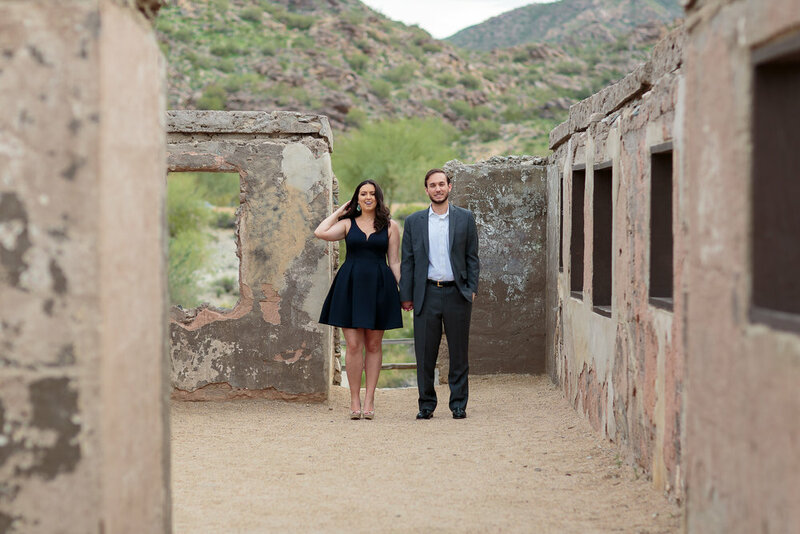 I want to put in a quick plug for working with a professional for your engagement photos. It was WINDY this day, you will see in a few photos coming up that her hair was whipping all over everywhere when we were out in the desert. Because she had a professional style it, I was always able to comb it back into place with my fingers, and her curls held throughout the entire session. If her stylist hadn't done such a great job then we might not have been able to get these beautiful formal shots where her hair is perfectly placed!! I cannot tell you how valuable it is to have a good style when that wind picks up in the desert. The warm, sunset light was so strong this evening, and I loved every second of it. 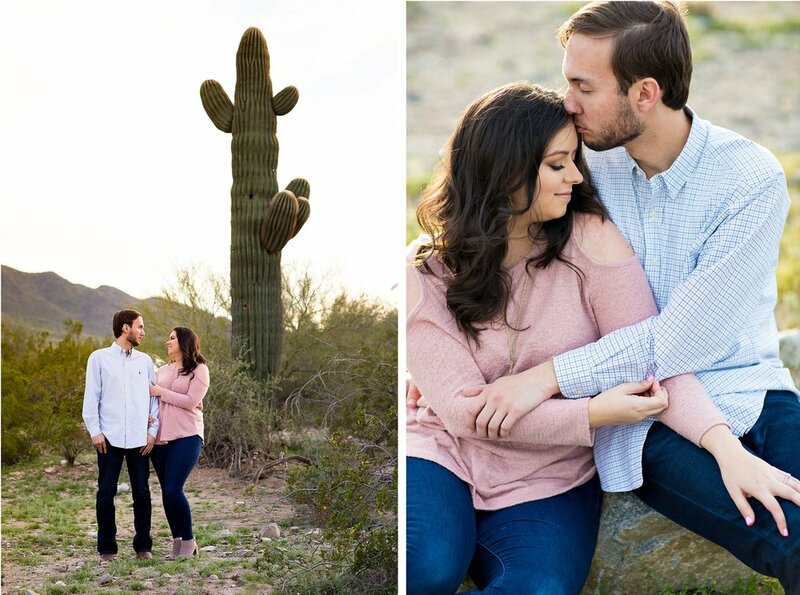 Jared and Janine changed into a bit of a more casual look, and the desert gave us some magic light to finish out the evening! This next one is one of my favorites, I can just feel their love for each other!! How much will they treasure this photo in 30 years?!? Janine's ring is one of my favorite engagement rings I have ever seen! So intricate and detailed, and beautiful! Seriously, good job, Jared!! Thanks so much for spending the afternoon with me, guys! I love your engagement photos! !